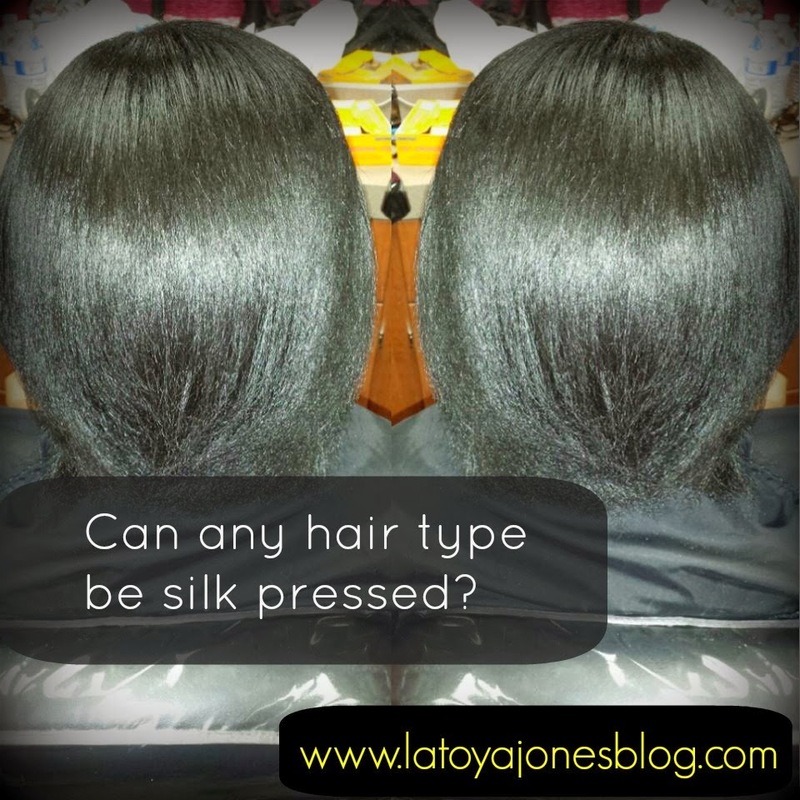 Can Any Hair Type Get A Silk Press? The client featured in this post was a new client. 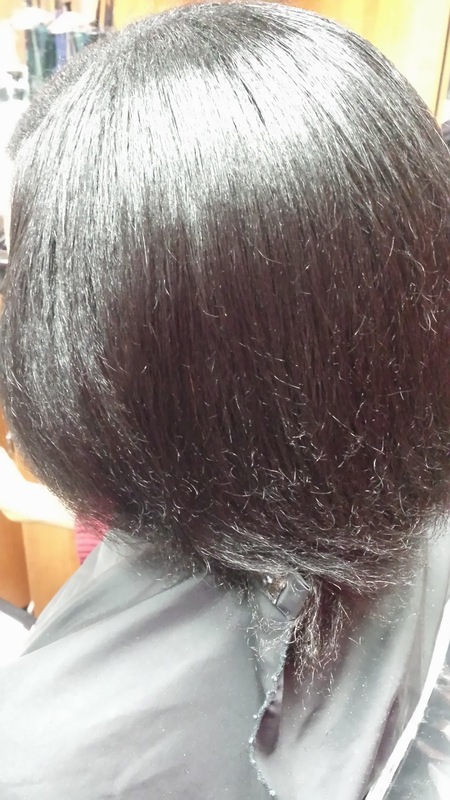 She tickled me because the day before she came in, she called me first wanting to know if any hair type could be pressed into looking like relaxed hair without the actual relaxer. 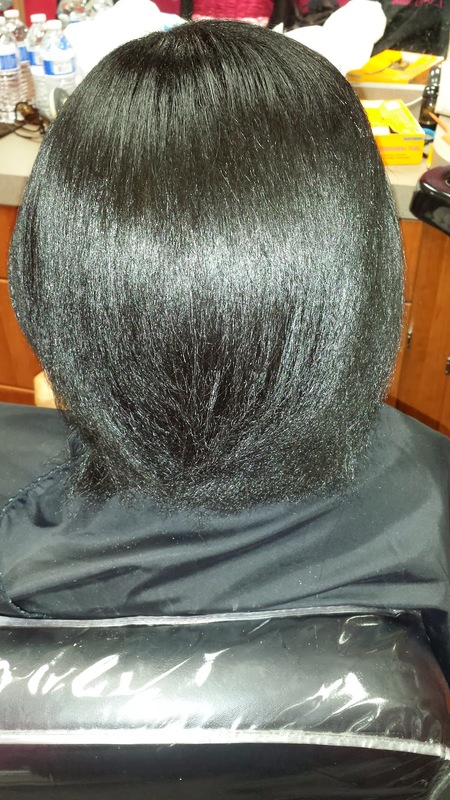 She said that her hair was very thick and extremely coarse and that she had a tight curl pattern. I chuckled before telling her that I could handle any hair type. She hesitated, and then made the appointment. When she came in she did in fact have the exact same hair that she described on the phone. Nevertheless I was ready! I took a before picture and it mysteriously disappeared! The only pics I could find were the after pictures. I started by shampooing her hair three times with Silk Hydration by L. Jones Extreme Clean Clarifying Shampoo. I wanted to be sure that there was no dirt, oil, or residue on the hair and give me a clean slate. She requested a rinse, so after that I put a black semi permanent color on her hair and let her sit under the dryer. After rinsing her color out, I then applied Silk Hydration by L. Jones Intense Moisturizing Treatment to add the good moisture back into the hair. 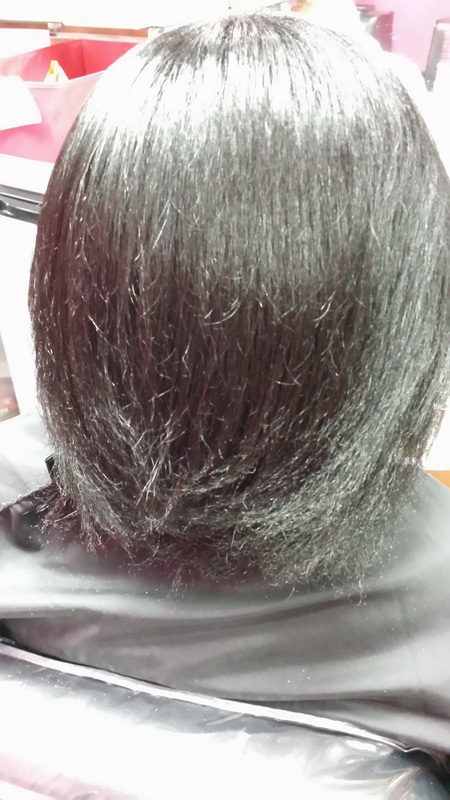 Next, I then put Silk Hydration by L. Jones Leave-In Conditioner on the hair and I was not stingy with it either. I put LOTS of it on her hair to help me detangle it as well as to soften it up even more. Since my leave-in is very light, you can use it as generously as you would like and it will still leave the hair light and full of body so the hair will still move. After blow drying the hair and pressing it, this was the end result. I did not use any oil in her hair whatsoever and this was still the end result. She felt it and said that her hair was very soft and silky! All she need to do is wrap her hair every night and it will remain like this. The minute she shampoos her hair the natural curl pattern will come back. I love how all your clients leave with belonging hair.